Networking has been a key part of business life in the City for centuries and continues to be so. People do business with people. The more you “know, like and trust” someone, the more likely you are to do business with them. However, many of the women I work with in the City find networking uncomfortable and seek to avoid it where possible. Yet it has been demonstrated that avoiding networking or ineffective networking can be detrimental to one’s career. In fact, in order to progress, most women need to do more – and more effective – networking than they are doing at present. · Business development - meeting current and new clients strengthens relationships which in turns, can lead to further business. · Having a wider external network also provides valuable contacts if one wishes to change organisation in the future. A strong external network can also lead to crucial relationships with mentors and coaches. · Networking internally is also key. It allows one to meet key players and build relationships with potential sponsors and internal mentors etc. · Networking both internally and externally is a valuable source of knowledge and information and helps you “keep your ear to the ground” in your organisation, profession, industry etc. · Having the support of a peer group is also invaluable both to handle current issues but also more widely to assist with navigating one’s career. Why Do So Many Women Find Networking Difficult? · Little evidence that networking has really worked for them before. In order to enhance your networking it is helpful to focus on both mindset and skills. · As with any change, it is helpful to explore your mindset around networking. By having greater awareness of your current mindset, you get the choice to change it. · How do you see networking? Do you see it being all about seeking to “get” as much as you can from everyone or do you also see networking as an opportunity to contribute? This perspective shift makes massive difference to many people I work with in terms of their feelings about networking. · To what extent do you focus on the benefits to be derived from networking rather than the challenges associated with it? As with many challenging dimensions of work (and life in general), the more you can get very clear on the rewards of the activity, the more motivated you will be to go through the “pain” or effort involved. · What beliefs do you hold about networking and your ability to network effectively? If you talk to those who genuinely love networking, you will discover that, not only do they have high level networking skills, but they also have very empowering beliefs about their networking ability. If your current beliefs are not helpful, which beliefs would be more helpful? · If you prefer not to network in pubs or bars etc, where would feel better to network? 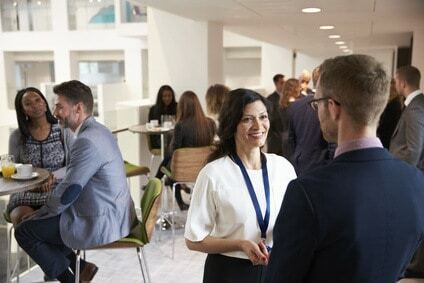 Identify locations or networking groups you prefer, where you will still be able to meet the people you would most seek to meet through networking. In addition to your mindset, effective networking requires a number of skills. Like other skills, they can be learnt. It can be helpful to divide networking into three phases and examine the skills and behaviours required at each stage. Preparation before the event is key. · Identify what you would like to get out of the event. If it is an external event, are you going to meet new potential clients, a mentor or professional colleagues etc.? If it is an internal event, who would be most helpful to meet? · Where possible, find out who is going to be attending. Where a list is available, you can look people up on LinkedIn and identify who you would like to speak to. Where the LinkedIn profile includes a photo (which is highly desirable), you may then be able to spot the people you wish to speak to in the room. · Take a moment to prepare your mindset and remember your value and also to remind yourself to contribute as much as you can, as well as seek direct benefit for yourself. · Make sure you have a clear “pitch” outlining who you are and what you do. · One of the key networking skills is focusing on others. Asking questions and listening to the answers is a very powerful way to build relationships. · Find ways to help others e.g. through offering to send them an article they may be interested in or through introducing them by email afterwards to someone who may be able to help them. · On arrival, one way to get into conversation quickly is to speak to someone else on their own. Another is to join a group and depending on the situation, either introduce yourself straight away or else do so at a suitable point in the conversation. · To leave an individual or group when you feel it is time to move on, where possible do so after you have finished speaking so your leaving does not appear any reflection on the other person/people. Thank the other/s and excuse yourself to get a drink etc. or indeed to explain that there is someone else you would like to have the opportunity to speak to. · Make a note of the names of those with whom you had the most valuable conversations and jot down the main points you discussed. This can be very valuable in developing the relationship going forward. · Follow up on any actions you agreed. · Where you have obtained agreement at the event, arrange to meet further for coffee. What Actions Could You Take to Enhance Your Networking? By addressing any of the above mindset dimensions that are not serving you or developing your skills and behaviours, you can significantly enhance your ability to network. It is important to remember that networking is just the beginning of a relationship that you will then be able to nurture going forward. With strong networking skills, you have a powerful lever to fast track your career. Catherine Cuffley is an executive coach and founder of Thinking Choices Limited www.thinkingchoices.com. She specialises in working with organisations in the City of London to help them to develop their women leaders. She works with senior professional women in banks, insurance companies, law firms and management consultancies etc. to support them in achieving their next leadership position. This may be a place on the board or indeed their first leadership position and everything in between. Catherine has spent many years in the City in a range of Human Resources, Learning and Development and management consultancy roles. She has repeatedly seen the way in which many talented women in City organisations are not quite reaching the more senior positions they seek. Catherine’s mission is to support women in fulfilling their potential and maximising their contribution whilst enabling organisations to optimise their female talent.